So what does a Pacific Northwest girl like me know about a Mint Julep? I confess I do not have many requests for this bourbon recipe at the restaurant in Washington State, but the bartenders and I know how to make a great one. This particular beverage is a Southern (USA) tradition. When my husband and I traveled through the South we tried a couple of these drinks. I really like the drink and I did a little research and thinking (believe it or not) when we returned home. 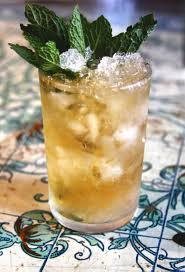 I read that the Julep was probably created in the 18th century and that U.S. Senator Henry Clay probably introduced Washington D.C. and northern states to this beverage. This drink also became the traditional or "official" drink of the Kentucky Derby. In fact, in May of 2006, Churchill Downs sponsored a fundraiser to support charitable causes dedicated to retired race horses. They served 50 Juleps in gold plated cups at a cost of $1000 each! Yep, they sold them all! I was amazed! As I mentioned, after visiting the South and thinking about the Mint Julep, I decided to run a little promotional at the restaurant. I promoted a taste test: the Mojito! 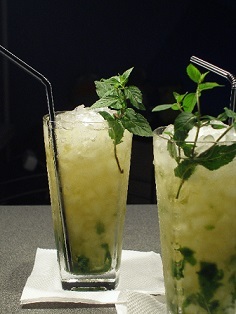 (a popular rum based drink) against the Mint Julep. I anticipated the Mojito would be judged "better," simply because of it being an "in" drink. I was wrong. The results of the taste test: 47 votes for the Mojito, 51 votes for the Julep! Preparation time: 10 minutes, but it must stand several hours to "capture" the full flavors. (Yes, you must plan ahead). Serves 10. Wow! This is so good! Enjoy your Julep drink recipe and the company of those you share it with! Did you know? Traditionally, spearmint is the mint of choice used in Southern states, and in Kentucky in particular. 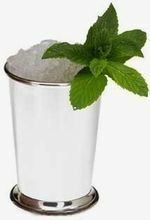 Historically, mint juleps were usually served in silver or pewter cups, and held only by the bottom and top edges of the cup. This allowed frost to form on the outside of the cup.